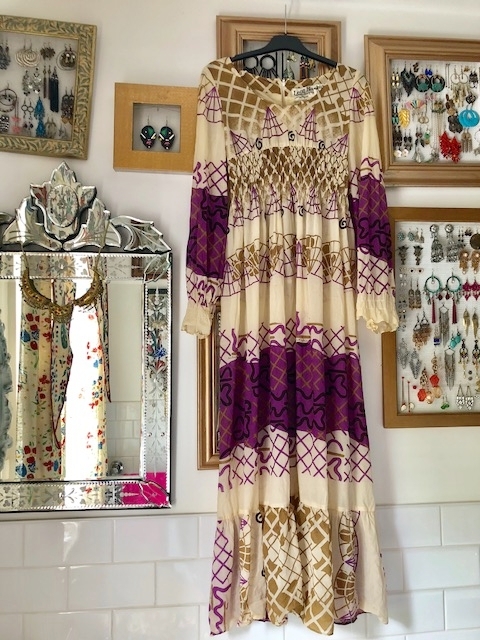 I was so excited to find this dress on eBay, a stunning 1970's dress designed and made by the design house - Leon Haskin and using a Zandra Rhodes print. I hadn't heard of Leon Haskin before and so with a little detective work I found out that Leon Haskin created his women's evening wear manufacturing business and label at 15 Flinders Lane, Melbourne in 1962. Haskin came from a family of fashion designers and manufacturers. His father Henry started his business, Henry Haskin and Co Pty Ptd, in Flinders Lane in 1919. Leon worked with his father for six years prior to the latter's retirement in 1959. Previously Leon had worked at the McBeath warehouse. Haskin relocated his business to Richmond in the 1980s. It is a stunning dress made from a simple cotton using a Zandra Rhodes 'signature' print. Easy to wear with a shirred elastic waist and cuffs, this is one piece that I'm sure to wear this summer ☀️.